Don't bank on Donald Trump becoming the 45th president of the United States. That's the message from the gamblers placing bets on the 2016 race for the White House. Trump is beating his rivals by double-digits in national polls, but bettors remain skeptical the billionaire's lead will last until the Republican convention in Cleveland. The former governor of Florida has 13-to-8 odds to be the Republican standard bearer. That is significantly better than Trump, who has 7-to-2 odds. That means a $100 bet would pay $163 if Bush wins, and $350 if Trump does. You may be wondering: What do a bunch of bookies know about the Iowa caucuses? Maybe not much. But just like in sports gambling, the odds reflect wagers being made by real gamblers. That suggests people are putting their money on the line to bet on someone they believe will win the nomination. Related: How many jobs has Donald Trump actually created? It's a striking contrast with the polls, which show the real estate mogul with a big lead. The latest CNN poll released on Thursday shows Trump at 32% support for the Republican nomination, ahead of Ben Carson, his nearest rival, by 13 percentage points. No other candidate -- not even Bush -- registers double-digit support. Greg Valliere, chief political strategist at Potomac Research Group, believes the gambling odds reflect a sense that Trump's harsh personality will eventually turn voters off. "At some point you'll have huge chunks of the Republican establishment concluding he'll be a disaster in a general election," Valliere said. Former Secretary of State Hillary Clinton is the favorite to win the White House, with 11-to-10 odds on Paddy Power. Jeb Bush is next with 4-to-1 odds, followed by Trump's 13-to-2 odds. Other gambling sites also reflect Trump skepticism. Bush is viewed as a favorite at Betfair, a British site, followed by Marco Rubio and Trump. 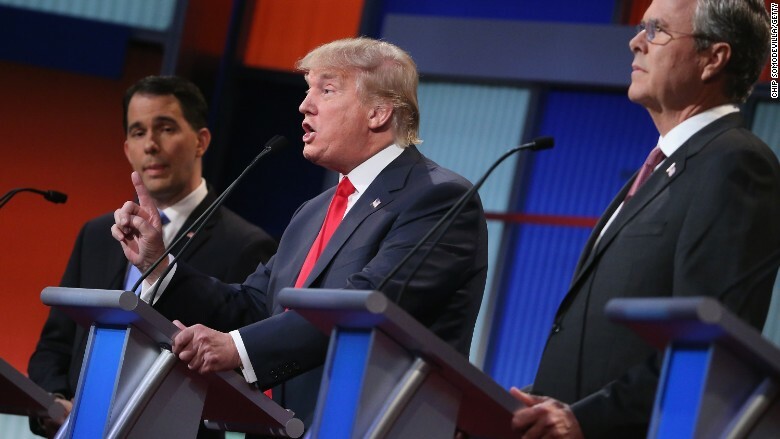 Interactive marketplace Pivit gives Trump a 20% chance to win the GOP race. Pivit, which powers the CNNPolitics prediction market, combines public opinion, news and data to produce live odds of event outcomes. Trump's chances of winning have climbed dramatically since early July, but they're only slightly better than Bush's 17%. John McNamara, Pivit's director of liquidity, said Trump's odds of victory are far smaller than he'd expect given his lead in the polls. "Donald Trump is new and he's volatile. He shoots from the hip. You have to price that in," said McNamara. He pointed to Trump's recent negative comments to Rolling Stone about the physical appearance of Republican candidate Carly Fiorina. "That would kill most candidates," McNamara said. Still, Trump could prove the gamblers wrong -- just as he defied the Washington establishment that thought he'd implode by now. "I've been wrong like most of the other 'inside the Beltway' alleged experts," Valliere said. "I thought Trump would fade by August -- and here we are in September."